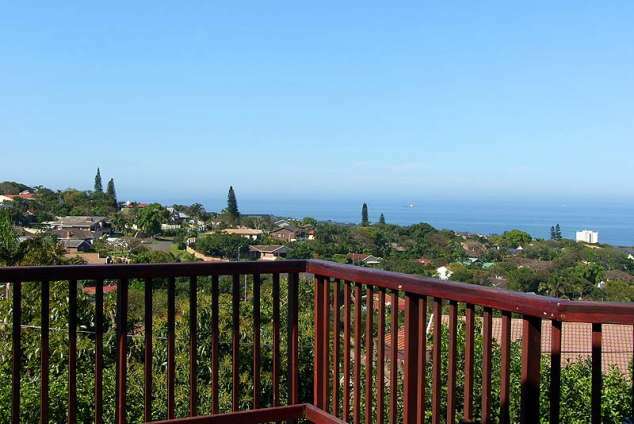 Blue Dolphin Ridge - Glenashley, Durban Accommodation. Nestled on the crest of the rolling hills overlooking the lush garden suburb of Glenashley & La Lucia with an awesome 180 degree (uninterrupted) sea view of the warm tropical Indian Ocean, Blue Dolphin Ridge provides secure and secluded accommodation for both business and leisure travellers. Blue Dolphin Ridge Self Catering Apartments is 25 minutes from Durban International Airport, 5 minutes from Kings Park Rugby Stadium and the new Moses Madiba Football Stadium, 10 minutes from Point Waterfront, Ushaka Marine World, Suncoast Casino Durban City Centre, The International Convention Centre (ICC), Umhlanga Village, Umhlanga Ridge Office Park, Gateway Theatre of Shopping, and Sibiya Casino and Entertainment Kingdom. We are in close proximity to a variety of tourist attractions, great restaurants, coffee shops and pubs. Our guests all enjoy the fact that the local Wimpy & Spar is only walking distance away. For the fitness fanatics Virgin Active Gym a mere 5 minutes drive. Blue Dolphin Ridge self catering apartments present, three self catering apartments of which two units have two bedrooms and one unit with one bedroom. All are en suite, modern, stylish and air-conditioned. Hotel package DSTV in all units. Units are modestly styled and modern with modern fixtures and fittings in Bedrooms,Bathrooms,Kitchens and the living areas are spacious and comfortable.Kitchens are well equipped throughout with Fridge Freezers and modern Hobbs.Built in Kitchen tops are granite with new spec appliances. For the business traveller, space is provided for work to be conducted from the apartments. For family and leisure travellers, our well equipped, self catering apartments will comfortably accommodate 2,4 and 6 persons per apartment. All our apartments are serviced daily and based around guest's needs. Secure Parking is on premises. 36520 page views since 19 Feb, 2009.